Dylan's got enough problems before the Virgin Mary shows up. He's stuck living in Jupiter, Florida, having moved there wih his widowed father, Doug, to take care of his Alzheimer's-riddled grandmother. He's not exactly enamored of his job caddying at one of the town's ten million golf courses. He's been banned from the internet after Doug caught him "trading e-mails with a thirty-seven-year-old woman with a filthy screen name." He's grumpy that Pluto has been downgraded from planet to dwarf. And slowly but surely, his memories of his mother are fading bit by bit; when they left New York City several years earlier, Doug inadvertently left behind the bag containing all of the family photos, leaving Dylan without any visual reminders of her. Right, the Virgin Mary. She shows up one morning, an apparition on a tree on the golf course. Word spreads quickly, and all of a sudden the course is crowded with pilgrims. Dylan finds himself drawn to a group of teenagers who've been dragged around the country by their parents, hot on the trail of sightings of the Blessed Virgin herself. He is most particularly drawn to Angela, as alluring a vision of teenage beauty as the frustrated Dylan could wish for. Now, if only she'd notice he exists for longer than it takes to break into his house. Lecesne writes primarily dialogue-driven work--the screenplay for the Oscar-winning short film Trevor, plays, television scripts--so it's not a surprise that his characters speak realistically and wittily. What's unfortunate is that the first two thirds of the book write checks that the last chunk doesn't really manage to cash. As the action gets darker and occasionally weirder, it also gets less interesting; what might have worked in a visual medium is dull on the page. 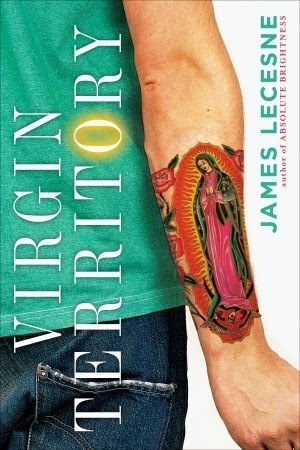 Still, though, Virgin Territory is hardly without its charms and its moving moments. Yes, the twists are obvious, but the voices of the characters shine through.